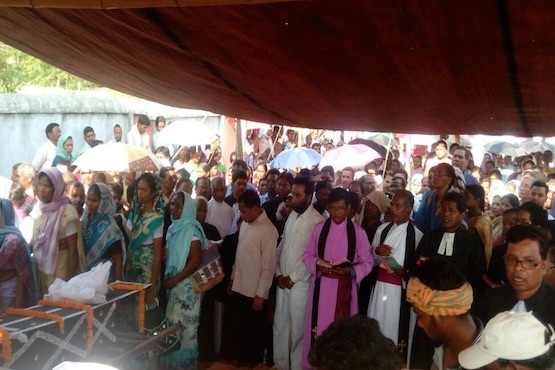 The murder of a Lutheran minister in India's tribal-dominated Jharkhand state shows that Christians are now becoming a target for attacks, Christian leaders said. The body of the Rev. Abraham Soreng of Goosner Evangelical Lutheran Church was found with multiple injuries May 6. His funeral was conducted on the next day in his Kadma village of Kunti district in Jharkhand. Kunti is a Christian stronghold district. About 25 percent of its 532,000 people are Christians. Investigating police officer Ranveer Singh, who examined the body, told ucanews.com that the murder appears to be the result of a conspiracy. The state, where the Hindu nationalist Bharatiya Janata Party is in power, has reported several crimes against Christians. Christian leaders such as Subhash Kongari consider this as part of an ongoing attack against Christians in the state. Kongari, who is state vice president of Rashtriya Isai Mahasangh (national Christian forum), said the murder is the "outcome of a deep rooted conspiracy against Christians" in the state. Kongari told ucanews.com that Jharkhand recently has been witnessing "organized crimes against Christians" orchestrated by Hindu organizations that are trying to make India a Hindu theocratic state. "Any act of violence is condemnable, when it comes to a religious person, it is more condemnable," said Auxiliary Bishop Theodore Mascarenhas of Ranchi, secretary-general of the Indian Catholic bishops' conference. "Efforts are underway to polarize the population in the state, which is not going to help anybody," he said. Jharkhand, with a population of 33 million people, now has some 1.4 million Christians, most of whom are indigenous people or those belonging to the dalit or former untouchable castes. The state's 4.5 percent Christian population is almost double that of the national average. Indian media has reported several instances of attacks against pastors, churches being destroyed and of Hindu groups beating tribal Christians, and threatening to kill them if they do not renounce Christ. There are also reports of forcing them out of the villages and banning missioners from villages. Jharkhand, created in 2000 from tribal-dominated areas of Bihar state, is home to a vibrant, mostly tribal Christian community. Hindu groups have also accused Christians of luring poor villagers to Christianity with material offers and have reiterated the party's demand for laws to check conversions to Christianity.